Broad-winged Hawks are a secretive species during the nesting season, spending much of its time within the forest canopy. Their call is a distinctive high, thin whistle, not a sound that most people would associate with a hawk. Broad-wings are best known for their impressive fall migrations, when thousands of individuals travel along eastern ridges, through Texas, and on to their wintering grounds in Central and South America. 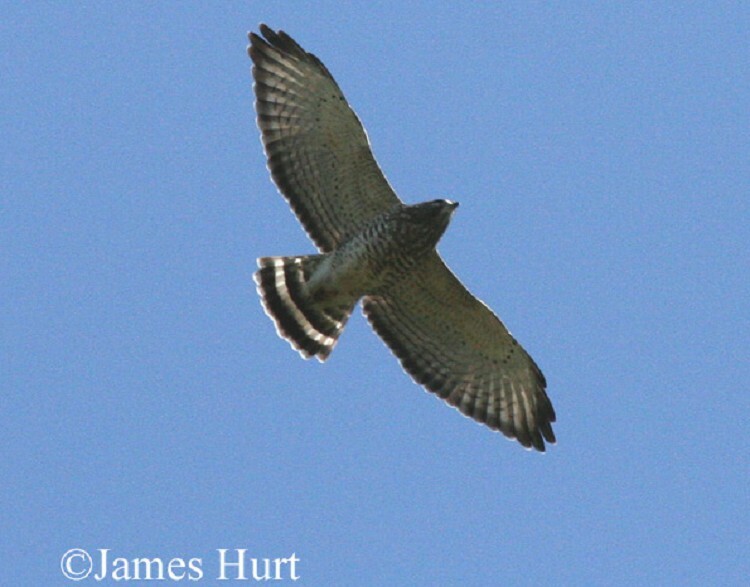 Broad-winged Hawks are found in Tennessee from early April through early October, and can be seen migrating along the ridges of East Tennessee in the fall. Description: This medium-sized hawk has a stout body, a brown back, a reddish chest, and a short tail with broad black and white bands. In flight, the underwing is pale and has a dark outside edge. Males and females look alike. First-year birds look similar to adults, but the underparts are white with brown streaks, and the tail is buff with thin dark bands. Red-shouldered Hawk has reddish shoulders when sitting. The tail is also banded, but the white bands are narrower than the black. The chest is more solid orange, and the wingtips are more rounded. Habitat: Breeds in deciduous and mixed forests. Diet: Small mammals, birds, reptiles, amphibians, and insects. Nesting and reproduction: Broad-winged Hawks are monogamous, and most do not breed until at least 2 years of age. Clutch Size: 2 to 3 eggs. Incubation: The female incubates the eggs for 28 to 31 days. Fledging: After the eggs hatch, the male brings food for the female and the young. Later, both adults feed the young. The young fledge in about a month and are independent at about 8 weeks old. Nest: Both adults collect sticks, but the female does most of the nest building. The nest is built close to the trunk of a large tree, usually within 500 feet of water, and near a forest opening. Nest heights in Tennessee range from 25 to 65 feet above the ground, and average 42 feet. Status in Tennessee: Broad-winged Hawks are a fairly common migrant and summer resident in eastern Tennessee, and less common in the west. They usually arrive by early April and depart by early October. The population appears to be stable. During migration, Broad-winged Hawks are often seen swirling in "kettles." These birds are rising on late-summer thermals, a cheap way to gain altitude, as they travel toward the wintering areas in Central and South America. In a recent study, satellite transmitters were attached to the backs of 4 Broad-winged Hawks as they prepared to migrate south in the fall. The birds traveled an average of 4,350 miles to northern South America, flying an average of 69 miles per day. While on the wintering grounds, they generally stayed within a 1 square mile area. The oldest known Broad-winged Hawk in the wild was 16 years, one month old. Best places to see in Tennessee: Migratory flocks can be seen in mid-September over the ridges of East Tennessee. Soddy Mountain Hawk Watch near Chattanooga is a good place to see flights of Broad-winged Hawks in mid-September..
Goodrich, L. J., S. C. Crocoll and S. E. Senner. 1996. Broad-winged Hawk (Buteo platypterus), The Birds of North America Online (A. Poole, Ed.). Ithaca: Cornell Lab of Ornithology; Retrieved from the Birds of North America Online.